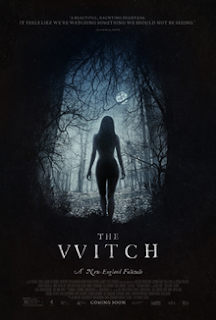 Tag line: "Evil takes many forms"
The Witch, a 2015 horror film from first-time writer / director Robert Eggers, is the kind of movie that reminds me why I love the genre so much; an imaginative, original film with impressive set pieces, an engaging story, and tremendous performances all around. It is a movie that works on just about every level, resulting in a unique motion picture experience I won’t soon forget. Subtitled A New England Folktale, The Witch whisks us back to the 17th century to witness the trial of William (Ralph Ineson), a deeply religious man whose beliefs have alienated him from the rest of the community. Ordered into exile, William packs up his belongings and, along with his wife Katherine (Kate Dickie), daughter Thomasin (Anya Taylor-Joy), son Caleb (Harvey Scrimshaw), and fraternal twins Mercy (Ellie Grainger) & Jonas (Lucas Dawson), heads into the wilderness to start a new life. Some time passes, and the family, now living in a farmhouse situated next to a large forest, has welcomed a new member: infant son Samuel (Axton Henry Dube & Athan Conrad Dube). One day, while Thomasin is babysitting, young Samuel seemingly disappears into thin air. William believes the child may have been carried off by a wolf, but in reality, it was a witch, living deep in the woods, who snatched Samuel, and she plans to use the infant (parts of him, anyway) to help rejuvenate her powers. Samuel’s disappearance is the first of several calamities that will befall the family, and with each new disaster, it becomes more apparent to them all something evil is at work, leaving William and Katherine to wonder which of their children has brought this darkness upon them. Shot on-location in Kiosk, Ontario, The Witch utilizes costumes, set pieces, and period-style dialogue to great effect, perfectly recreating the film’s 17th century time period. In addition, the underlying issues that exist within the family (its strong religious convictions, William’s failure to adequately provide for them in the wilderness, Caleb’s budding sexuality, etc), coupled with the area in which they’ve settled (director Eggers shoots the woods in such a way that we know well before its characters do that something ominous lurks within), introduces a level of tension that only grows stronger once the witch enters the picture. Add to this the extraordinary performances (Ineson is strong as the father struggling to keep his family together, yet its Anya Taylor Joy who steals the show as Thomasin, a young girl who may or may not be the root of the evil that torments them) and a surprise ending you won’t see coming, and you have what amounts to one of the best horror films of the last five years. Dark and creepy, The Witch is a winner. I really need to see this one! So many other movie bloggers have panned it. Your take was a breath of fresh air. Hm. I really liked it but found the ending a misfire. Great cinematography, directing and acting though. Intense and constantly building, just wish he'did gone in a different direction at the very end.